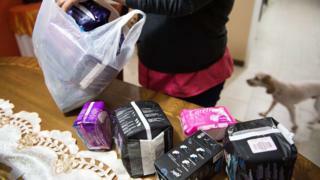 The discovery of a huge "fake sanitary towel" operation in southeast China has prompted fears about the possible impact on women's health. Police in Nanchang, Jiangxi Province, say they have arrested two suspects believed to have produced millions of the fakes in dirty facilities. The fakes are thought to have gone on sale across China since 2013. Chinese authorities have warned against buying discounted products, saying there could be serious health risks. The Nanchang Public Security Bureau says it seized fake sanitary towels with a resale value of more than 40m yuan ($5.9m; £4.8m) in a factory with no disinfection facilities. The fakes were then sold in supermarkets under the trademarks of leading Chinese brands such as ABC or Whisper, the Nanchang News reported. It is not yet clear whether they were distributed internationally. Consumers have been urged to check the packaging before buying because the colouring of the fake products is reportedly slightly darker. The scandal was one of the biggest talking points in Chinese social media on Thursday. Tens of thousands of Sina Weibo microblog users posted under the hashtags #Over10MillionFakeSanitaryTowels and #SanitaryNapkins. Some social media users have called for the "evil" suspects to be given the death penalty. "Why would someone want to hurt me at my most vulnerable?" asked social media user Sdanler. Another social media user, zhou6665, said someone she knew bought fake sanitary towels and suffered a urinary tract infection followed by inflammation. Others warned that women in rural China could be especially at risk, as they have less access to information and are more reliant on cut-price products.